Letter to the editor: Autism is a wide spectrum disorder and a lot of factors play role in the etiology. Autism may accompany some genetic disorders such as fragile X, tuberosclerosis, neurofibromatosis and phenylketonuria . However, the absence of sufficient evidence on the etiological roles of environmental, neuroanatomical and biochemical factors has shifted the direction of research to genetics and cytology . Keywords: Autism, genetics, metabolic cytopathy. The patient was a 25 years old male. He had symptoms such as stereotypic behavior, screaming, very limited eye-to-eye contact, very limited conversation, forcefully imposing his wishes, doing only what he wanted, not cooperating, and moving around constantly during the psychiatric examination. He has been under our follow-up for the last 12 years since he was 13 and diagnosed as Autistic Disorder at that time. He was prior diagnosed as ‘Attention Deficit Hyperactivity Disorder’ before the age of thirteen and prescribed methylphenidate and developed drug-associated hypertension. 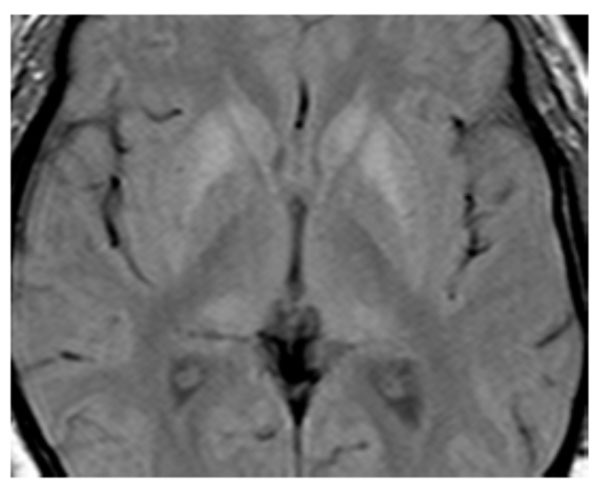 The patient was initially administered clomipramine 75 mg/day and pimozide 1 mg/day. Then the medication was shifted to clozapine 25 mg/day. Later, risperidone 1.5 mg/day was used. His family history was unremarkable except for one cousin with autistic features. The cranial magnetic resonance imaging were performed and in axial proton density-weighed (PD-weighted) images, hyperdense signal changes were detected in bilateral putamen, head of caudate nucleus and posterior thalamus (posterior pulvinal) (Fig. 1a), and minimal signal increases were seen in dentate nucleus in both serebellar hemispheres (Fig. 1b). 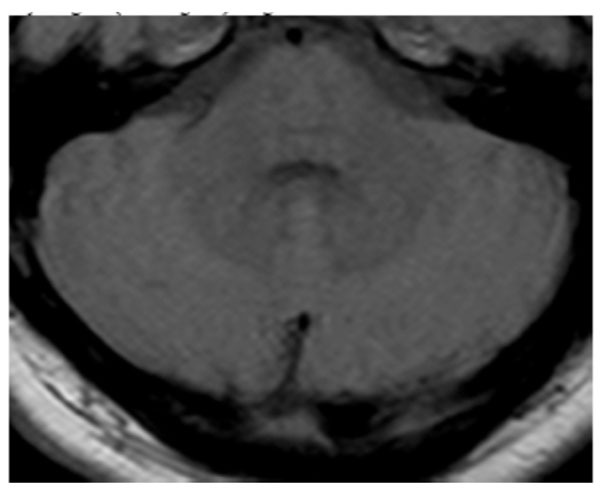 In axial T1 weighted images hyperdense signal changes were seen in bilateral putamen, head of caudate nucleus and posterior thalamus (posterior pulvinal) (Fig. 2a) and in dentate nucleus in bilateral serebellar hemispheres (Fig. 2b). 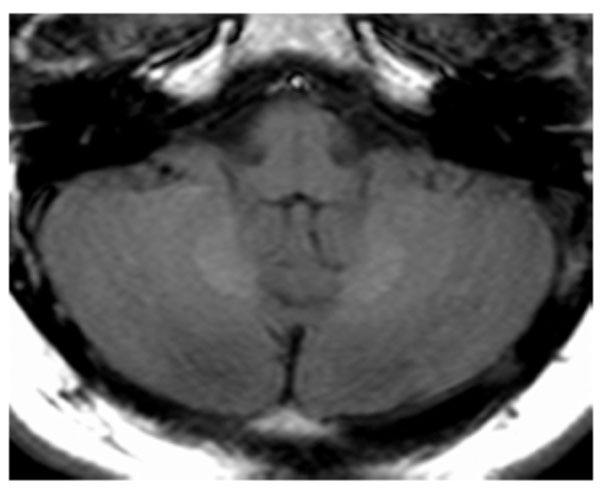 Hyperdense signal changes in bilateral putamen, head of caudate nucleus and posterior thalamus (posterior pulvinal) in axial proton density-weighed (PD-weighted) images. Minimal signal increases in dentate nucleus in both serebellar hemispheres in axial proton density-weighed (PD-weighted) images. 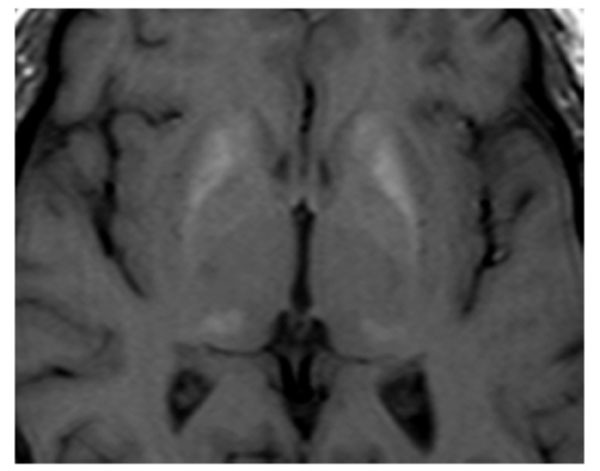 Hyperdense signal changes in bilateral putamen, head of caudate nucleus and posterior thalamus (posterior pulvinal) in axial T1 weighted images. Hyperdense signal changes in dentate nucleus in bilateral serebellar hemispheres in axial T1 weighted images. The tests for genetic mitochondrial disease or metabolic errors of amino acids and organic acids yielded no positive results (corpuscular blood cells, peripheral blood smear, enzyme levels, hormones, blood and urine biochemistry).The patient underwent evaluation by neurologists, biochemists and radiologists, but no etiologic factors could be detected. The present condition was considered to be an unconfirmed ‘metabolic cytopathy’. Medical conditions, cytogenetic anomalies and single gene disorders which are considered as causes of autism are responsible only for 10% of all autistic cases. Therefore, an underlying medical condition is very rare [3, 4]. On the other hand, a lot of metabolic disorders are associated with symptoms of autism, although the extent of metabolic anomalies in the spectrum of autistic disorders is unknown. Considering that autism is a wide spectrum disorder and a variety of factors play role in the etiology, it should be kept in mind the contribution of environmental factors. Although these environmental factors are suggested to be effective in only a minority of cases and that these factors may even trigger the disease in individuals who carry alleles with risk [5, 6], it is clear that the presence of non-genetic factors in the etiology of autism should be investigated further. Autistic cases should be classified into subgroups according to the underlying genetic risk, it may even be possible to define a special subgroup which would cover the metabolic cytopathy as presented in our case. In conclusion, it is possible that autism due to metabolic causes is of genetic origin; however, this condition should be detected by a molecular approach. Trottier G, Srivastava L, Claire-Dominique W. Etiology of infantile autism: a review of recent advances in genetic and neurobiological research J Psychol Neurosci 1999; 24: 103-5. Lamb JA, Parr JR, Bailey AJ, et al. Autism: in search of susceptibility genes Neuromol Med 2002; 2: 11-28. Muhle R, Trentacoste SV, Rapin I. The genetics of autism Pediatrics 2004; 113: 472-86. Jamain S, Betancur C, Giros B, Leboyer M, Bourgeron T. Genetics of autism: from genome scans to candidate genes Med Sci 2003; 19: 1081-90. Korvatska E, Van de Water J, Anders TF, et al. Genetic and immunologic considerations in autism Neurobiol Dis 2002; 107-25. Glasson EJ, Bower C, Petterson B, de Klerk N, Chaney G, Hallmayer JF. Perinatal factors and the development of autism: a population study Arch Gen Psychiatry 2004; 61: 618-27.